Columbia Southern Education Group is proud to honor fallen service members and their families through the Living Legacy Scholarship. 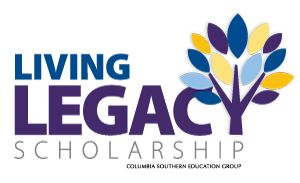 Through the Living Legacy Scholarship, children, parents, siblings and spouses of fallen service members are eligible to receive a scholarship for up to $23,400 in one online degree program at Columbia Southern University or Waldorf University. The scholarship will cover up to $23,400 in one online degree program (associate, bachelor or master) at either Columbia Southern University or Waldorf University. The scholarship will be directly applied to the recipient’s tuition for up to 60 semester hours or 36 consecutive months in the selected online degree program, whichever comes first. This scholarship covers tuition only. Textbooks and fees are the responsibility of the scholarship recipient.